Answers accepted in French and/or English. Archive Alert: Sugar High Friday from this time last year. Apples! How terrible my photographs were back then. Peut-etre des tripes ? Have a nice trip back. I am guessing (and this is a total guess) some kind of red curry with greens of some type. Am I even close? By the way, those of us who have been through jet-lag will understand completely if you take a few days off. Wait! Wait! I know! I know! It's...it's...it was...delicious! It's not Salt Lumps, is it? I see morels, peas, carrots, zucchini (usual jardinière accompaniments), parsley, cream, and some porky looking bits... ham? bacon? pig's feet? (and a messy schmear on the side of the plate - love that you didn't wipe that off). Have a good flight. Hope you packed some nice food - nothing better than a gourmet picnic on a plane. fricassée de potiron et petit pois à la pacetta !!! No ones guessed it yet. I would guess a creamy lobster stew with wild morel mushrooms, carrots, capers and parsley. 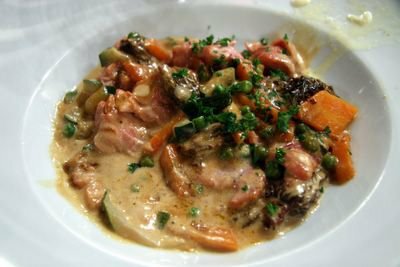 Ris de Veau with Morels.